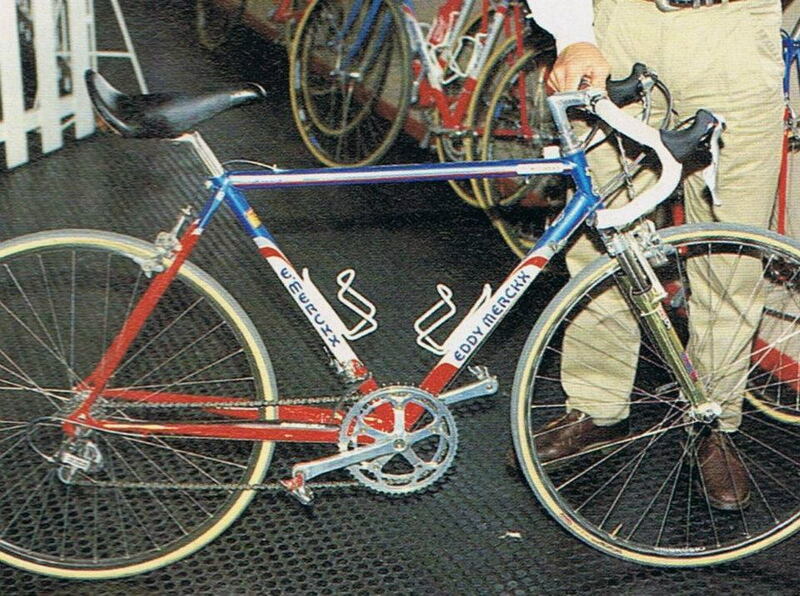 Steve Bauer's bike for 93 Paris Roubaix. … complete with RockShox fork from a... '90s era Giant MTB? he had a number of bikes like that, I think. Most of them would have had a rigid fork. There was a time when a lot of people were using suspension of some kind on Paris Roubaix. Semi-recumbent geometry/pedal forward/crank forward/whatever the marketing team wants to call it. I think the UCI got rid of them by banning the saddles or any saddle that was tilted down too much. They recently relaxed the saddle rules a little because some people like their saddle tilted down more than the previous rules allowed. on edit: As far as I can tell, there was just one bike, and they did have another fork for road racing. Steve Bauer decided he didn't like it and seems to have ridden it in only 2 races. It looks like it would be impossible to sprint out of the saddle, which seems like it would be a big negative. Last edited by unterhausen; 03-01-19 at 02:25 PM. Electra geometry before they existed. I read elsewhere that Merckx really resisted building this bike. I would really resist it too. Where did he get those lugs? He told people he built it because the Motorola team wanted it. I think Walmart and GMC eventually copied that geometry and put it on most of their bikes. Crank forward is not a bad idea for people who want to be able to touch the ground from the saddle. You can do that and have a decent leg extension with this design. I rode the 120 mile round trip of a popular rail trail near here, and there was a very small percentage of people who had their saddle at a decent height. I wanted to tell some of them they really needed to raise their saddle, but as it is I almost lost my voice saying I was passing. ...and epic they were! He went off the front in '92 and won by 20 seconds! ...at 37 years old to boot! He da MAN!